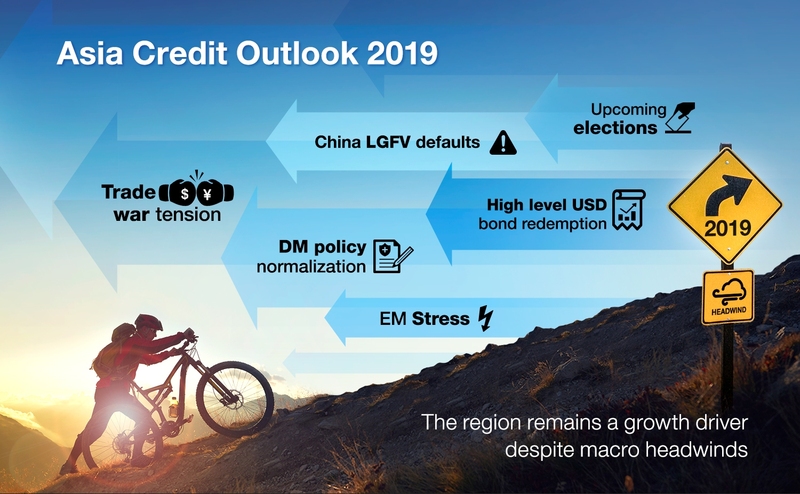 Our balanced view on Asia’s credit markets at the beginning of 2018 has given way to a murkier outlook for early 2019 as trade tensions escalate and yields on US treasuries surge -- though Asia remains the world’s growth driver despite the turbulence. As of now it remains to be seen how trade tensions will impact corporate profits in Asia. This fact, together with the upcoming elections in India and Indonesia – not to mention a high level of USD bond redemption -- may signal that market volatility could remain high next year. What is more, overall USD bond supply may decline considering where bond yields are, which means some corporates may opt not to use the bond market to raise debt. The numbers illustrate this trend: year-to-date USD bond supply in Asia ex-Japan amounted to USD185m which dropped 16% year-over-year. We expect this year’s USD bond issues will amount to USD240-250m (versus USD290m in 2017) -- and will probably increase slightly in 2019. I. Is another sell-off on the horizon? How did 2018 arrive at this point? Put simply, the mid-April US dollar bond sell-off was mainly driven by rising UST yields, and a deteriorating EM macro backdrop which led to weaker EM and Asian currencies. A domino effect ensued, pressuring Indonesian corporate bonds and then spreading out further to Chinese credits arising from a spate of defaults in China’s onshore market. As of June, Asia credit as measured by the JACI had widened 9 basis points year to date. At the time, we downgraded our Neutral stance to Underweight for H2 2018 – and that view will likely hold through Q1 2019. JACI has widened 36 basis points year to date since then. The saving grace is that current valuations look more reasonable in Asia credit as compared to other emerging markets. That means another sell-off is unlikely in the near term -- although investors would be wise to remain highly selective within Asia credit. On that note, there is value in select Indonesian corporates, but this is counterbalanced with the uncertain outcome of elections scheduled for April 2019. By way of comparison, Indian corporates could underperform given their rich valuations – while Thai and Malaysian corporate bonds are not offering much value in the current climate though they are seen as relatively defensive credits. As usual, the proverbial elephant in the room is China – and many forecasts indicate that the RMB will continue to weaken in 2019 amid ongoing local growth challenges, the notable expansion of monetary policy, and worsening global external conditions (e.g. Sino-US trade tensions, EM stress and DM policy normalization / quantitative tightening). In the short term, a weaker RMB may dampen investor appetite for RMB bonds – both onshore and offshore – given that interest in RMB-denominated assets among international investors is often a bet on currency appreciation. Investors should also keep an eye on the RMB-USD exchange rate. Should it breach 7 against USD, this could pressure other Asian currencies such as IDR and INR, which in turn, may weaken investment sentiment in Indonesian and Indian corporate bonds. The good news is investment grade China corporate bonds have performed relatively well, but supply will likely remain high from state-owned enterprises (SOEs). In this environment, state-owned oil names look like the safest bet. On the other hand, we are generally cautious on China’s local government financing vehicles (LGFVs). 2019 will test whether LGFVs will redeem their USD offshore bonds, given the high level of USD bonds maturing next year. China’s property sector is starting on a downward cycle, but we expect consistent USD bond supply from the property sector in light of refinancing and expansion needs. Despite this downward trend, short-dated China property bonds -- as compared to China high-yield industrial names – are still more attractive, considering the corporate governance concerns surrounding some firms. Last but not least, moving into 2019 global yields will gradually increase as central banks normalize monetary policy, following a long period of low – and sometimes negative, rates – that took hold in the wake of the global financial crisis. Although we don’t have a crystal ball, it’s conceivable the Fed could hike the Fed Funds Rate four times in 2018 (the Fed has already hiked three times with the last hike this year expected in December) and two times in 2019, before taking a pause through 2020. Consequently, the 10-year US Treasury yield, currently at 3.18%, could rise moderately to 3.25% by end-2018. Why is this important for Asian credit? In short, treasury yield increases, if they occur in a short period of time, are generally negative for credit spreads and total returns -- especially for Investment Grade, which comprises roughly four-fifths of the Asian credit market. That means in addition to remaining highly selective in 2019, investors should also bear in mind the direction of US treasury yield moves more broadly.